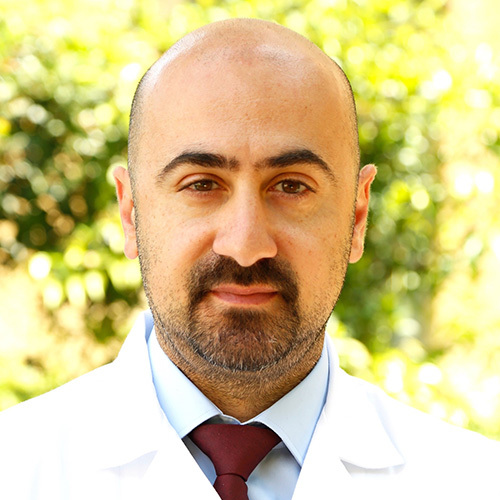 Dr. Joseph El-Khoury, MD, MRCPsych, is an assistant professor of clinical psychiatry at the American University of Beirut (AUB). He began his medical studies at St. George’s University in 1998 and, after qualifying as a medical doctor in London in 2002, he trained at Oxford University and St. George’s, University of London, in the UK, obtaining Membership of the Royal College of Psychiatrists (MRCPsych) in 2006. He has held a Certificate of Completion of Training (CCT) in adult and substance misuse psychiatry since 2010. In that same year, he was appointed as a consultant psychiatrist in the UK National Health Service. In 2012 and after 14 years abroad, Dr. El-Khoury returned to Lebanon to continue his medical career. Dr. El-Khoury directs the newly created Psychosis Recovery Outreach Program and is responsible for the residency training program at AUB. He also acts as the Global Mental Health Scholar for the Arab region for a joint program by Columbia University and the World Health Organization. He is enrolled in the Master of Science in War and Psychiatry track at King’s College London with an emphasis on trauma and political psychology. His current research and academic interests include addiction, severe mental disorders, health services development, the socio-political interface of psychiatry, conflict medicine, and cross-cultural psychiatry. You grew up in Lebanon, so what attracted you to medical studies at St. George’s University? I wanted a different experience and I saw an advertisement for SGU in my local newspaper. I liked what it offered, and my family was very encouraging about me traveling as part of my education. SGU also very generously offered me a 50 percent scholarship so it was a terrific opportunity for me. What made you want to follow a career in psychiatry? I was always interested in medicine but I enjoyed humanities as well. The mind impacts everything we do and this inspired me to learn more about it. I knew I wanted to be a psychiatrist from the start of my medical studies and I’ve never regretted my choice of specialism. What would you say to other students who are thinking of enrolling at a medical school in another country? I’ve benefited from studying and working in a number of different countries. I began my pre-clinical studies in Grenada and St. Vincent and the Grenadines in the Caribbean as part of the SGU course. I then had the opportunity to take part in an exchange program with Guy’s Hospital in London and ended up achieving a double degree from SGU and the Society of Apothecaries in the UK. After qualifying as a medical doctor, I trained at Oxford University and St. George’s, University of London and ended up working as consultant psychiatrist in the NHS for two years. The experience of working and studying in other countries and health systems was invaluable. I would encourage any student to seek out diverse experiences as part of their education. How would you describe your experiences at SGU? SGU was an important and solid stepping stone for me. It was an incredible mix of a studious and serious academic environment alongside Caribbean sunsets, wonderful food, and beautiful scenery. I took great pleasure in learning from the SGU professors who had so much knowledge to share. It was a stimulating educational experience surrounded by peers who became lifelong friends and it’s great to see how successful they’ve all become. I have very fond memories of my time there. What was it like to come back to Lebanon after 14 years abroad? I came back to Lebanon in 2012 because the country was, and still is, in need of psychiatrists. I took up a position at the American University of Beirut where I direct the Psychosis Recovery Outreach Program and I’m responsible for the University’s residence training program which is the biggest of its kind in Lebanon. I have a combined clinical and academic role which means I run a daily clinic and take part in advocacy work as well as research. The principles of psychiatry are the same wherever you practice. Once the cultural layer is removed, you see similarities in human experiences and that what we have in common is more than what separates us. If you’re well trained, then you’re ready for anything. Much of your research has a focus on the Middle East. How do you hope psychiatric care will change in the region in the coming years? I’m currently working towards a master’s degree in war and psychiatry at King’s College London with an emphasis on trauma and political psychology. I’m focusing my research on Lebanon, Syria, and Iraq because there hasn’t been a lot written about this in the Middle East. I was born during the civil war in Lebanon and I’ve also found that there isn’t a lot of data from this conflict, so I’m conducting a study to look into the mental health of people who lived and fought in it. I’m also researching psychosis service development in this region alongside addiction and its impact on mental health. I hope to see the standards of mental healthcare in Lebanon improve the level of wealthier countries. It’s going to take a lot of collective work and strong leadership. This is what I’ll aim for. It has been hugely satisfying to travel the world and then return to my home country and teach at the university where I was previously a student.